Staying within your budget each month is very much essential for aiding financial stability. Using a budgeting tool helps you to keep your finances organized. 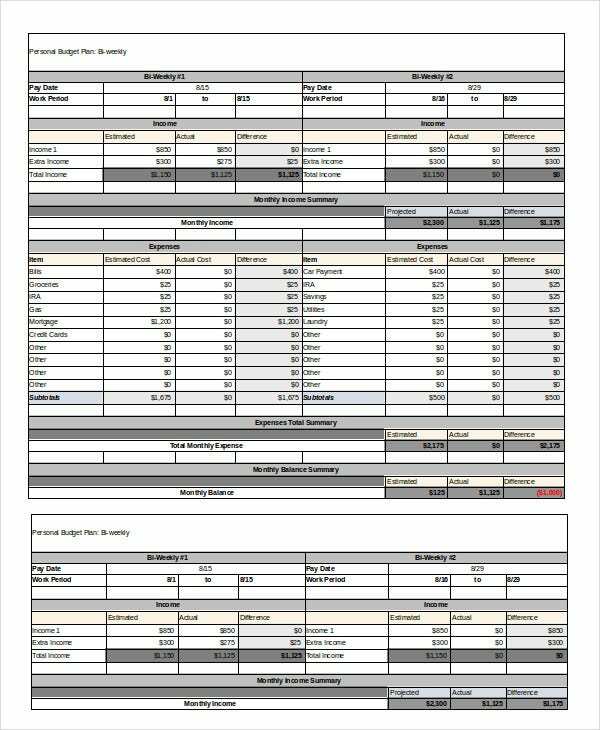 A simple and easy-to-use monthly budget samples can be used to tally up your income and expenditure and estimate their differences after identifying and considering all the factors involved. This will enable you to straighten out your finances and make some savings. 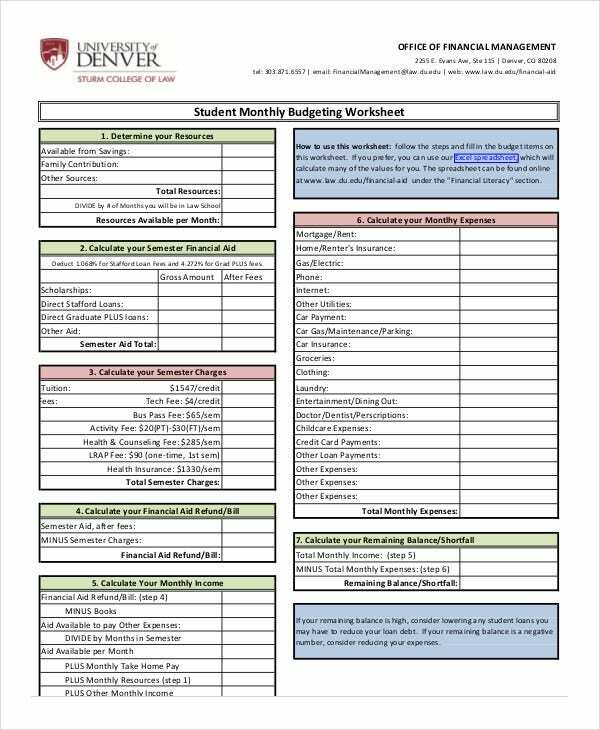 Here is a collection of printable monthly Budget Templates. 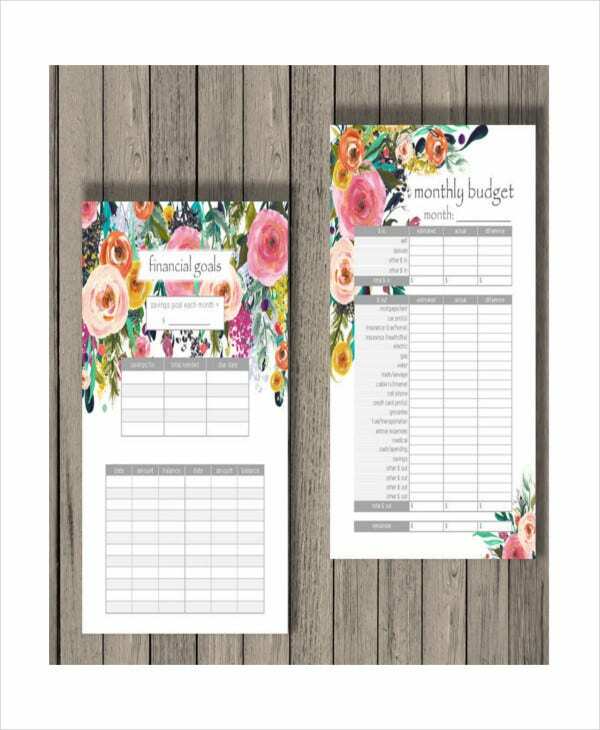 This A5 size template has yearly financial goals, debt payment tracker, savings tracker, monthly expenses tracker, title page, bills and payments tracker, yearly expenses, yearly balance, and a monthly budget planner. 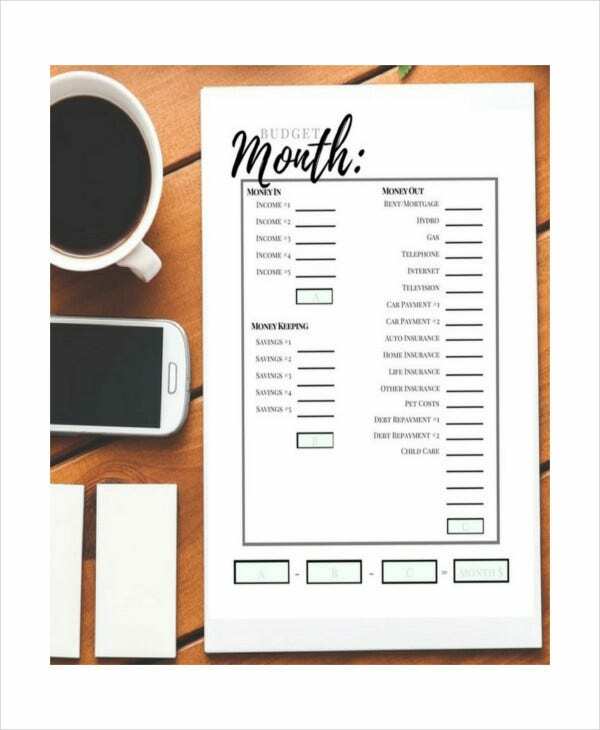 This freely downloadable semi-monthly budget template suits well if your income is received on the same date of each month. It can be used if you have only earning members in your family. > Why should you use a Monthly Budget Template? Maintaining a monthly budget helps you to live within your means, and make some savings. It helps you appreciate the value of your job since you get to realize that most of your receivables are from it. Your job appreciation attained through a monthly budget enables you to have a positive outlook on your job. Maintaining a Monthly Budget Template helps you to understand the value of hard work. A monthly budget helps you have complete control over your finances. It helps you to keep your expenses in check and ensure that there are no unplanned purchases. 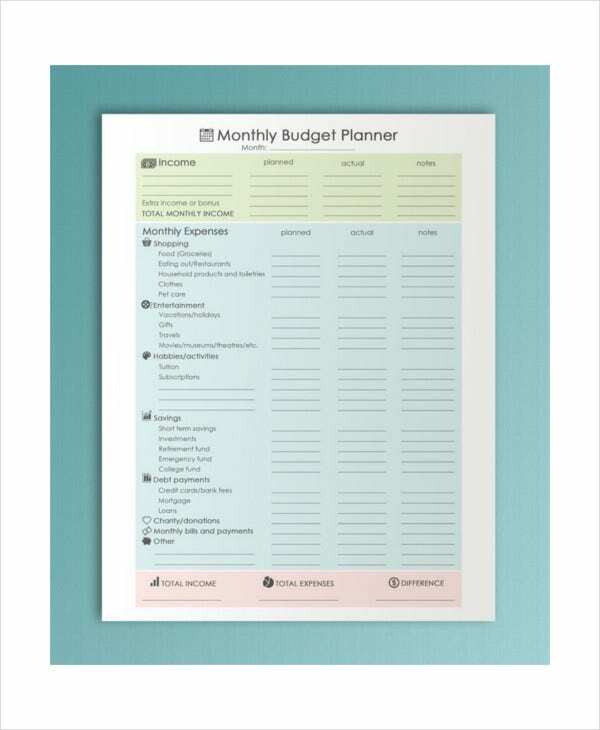 This monthly budget planner in PDF format comes for US$ 1.99. This is of size 8.5 x 11 inches. An A4 size version is also available. It includes a yearly financial balance sheet too. 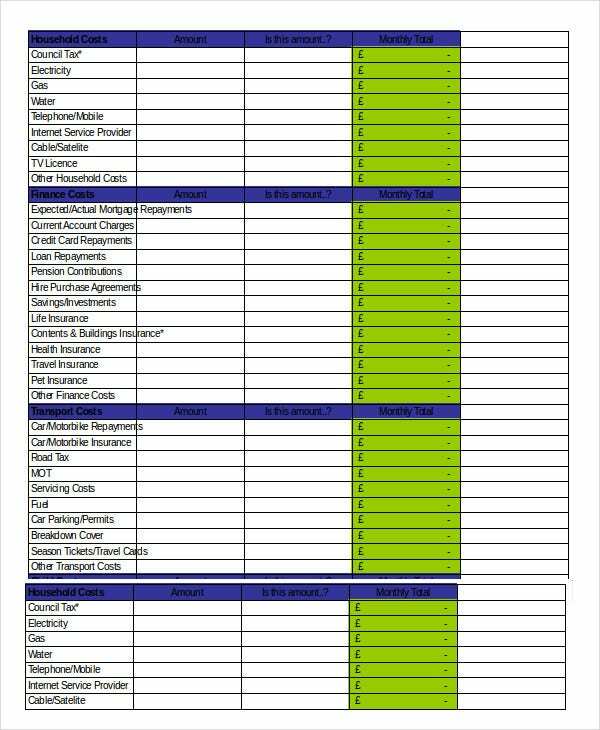 This free monthly budget sheet provides a comprehensive budget planning for consecutive 6 months for businesses. It enlists every recurring detail under income received, automobile related expenses, and office expenses. 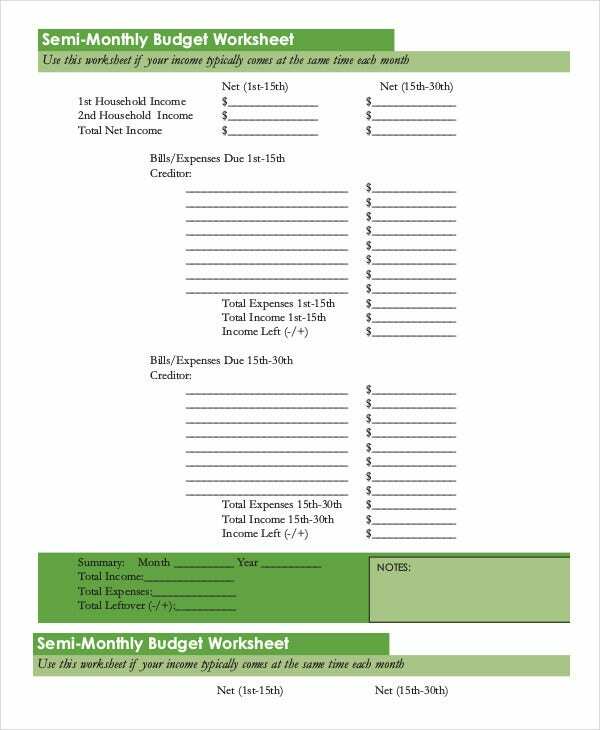 Available for $4, this monthly budget template is in PDF format. 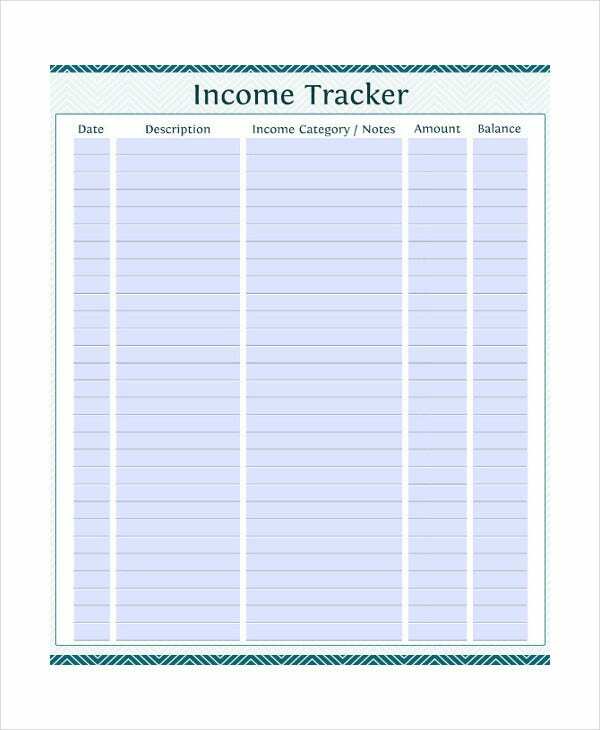 You can use it for tracking your budget in different areas of your life. You can include your own expense categories. 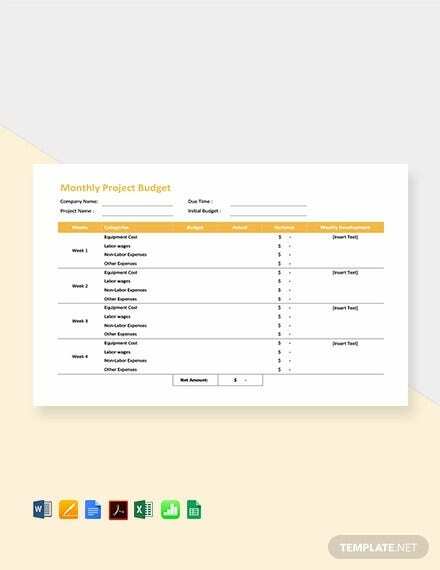 This free monthly/yearly budget template separately categorizes the income and expense sections of your budget and it also includes fields for tracking your planned expenses and the actual expenses incurred. 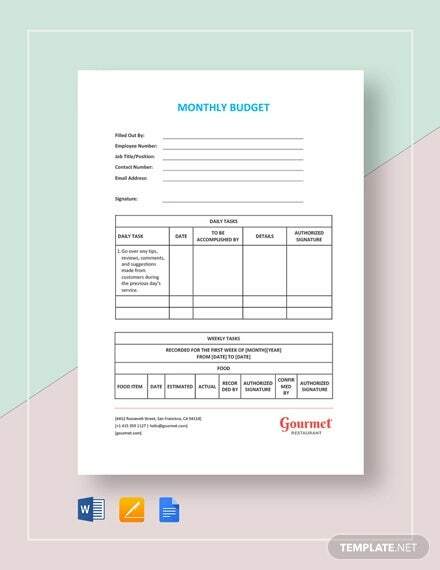 This monthly budget template costs $1.89. It includes fields for tracking the different categories under your income, expenses, and savings. It is in PDF format. 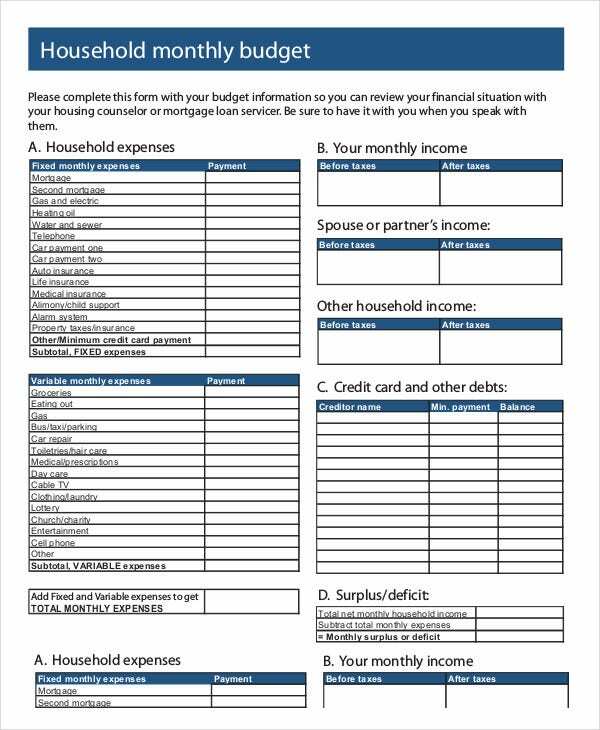 This household monthly budget template enlists all household incomes, fixed monthly expenses, variable monthly expenses, and credit card and other debts to help you understand your financial situation- whether it is surplus or deficit. 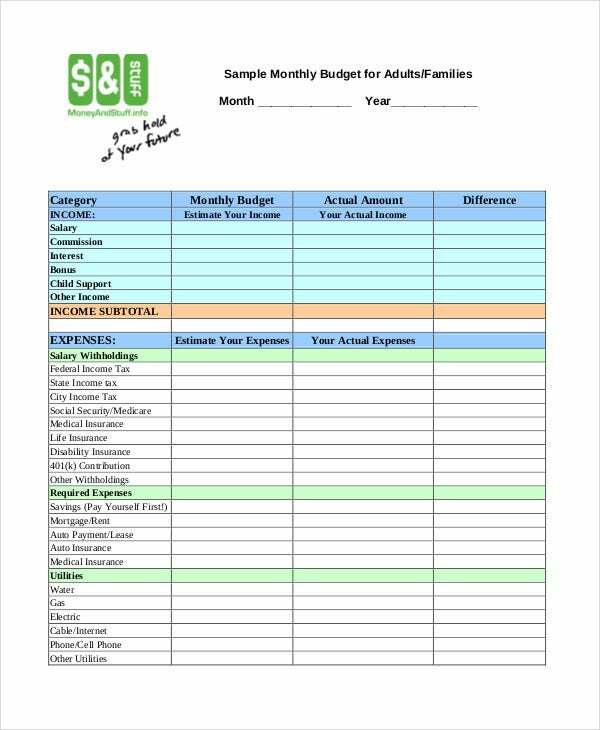 This free personal monthly budget template takes into consideration your income and different expense areas like housing, food, pets, loans, legal, personal care, gifts and donation, savings and investments, taxes, and entertainment. 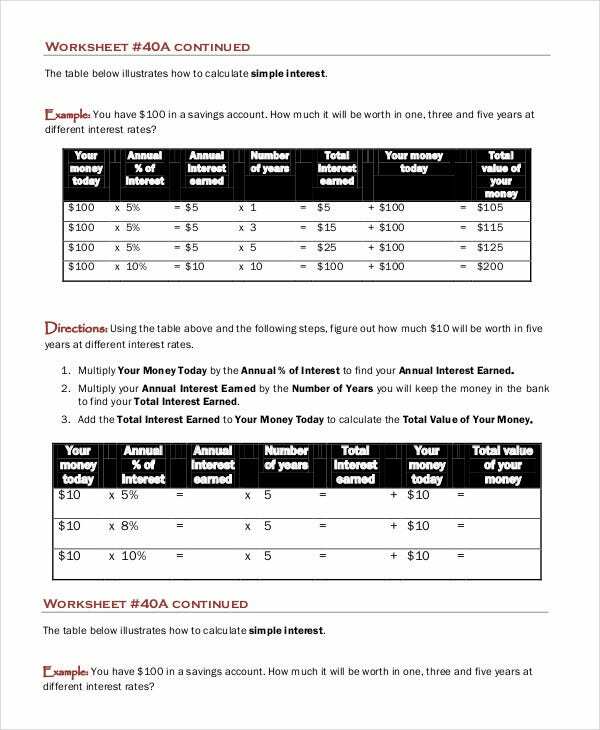 Developed for equipping individuals with financial literacy, this section includes activities, worksheets, and resources for budgeting the different areas of their lives. 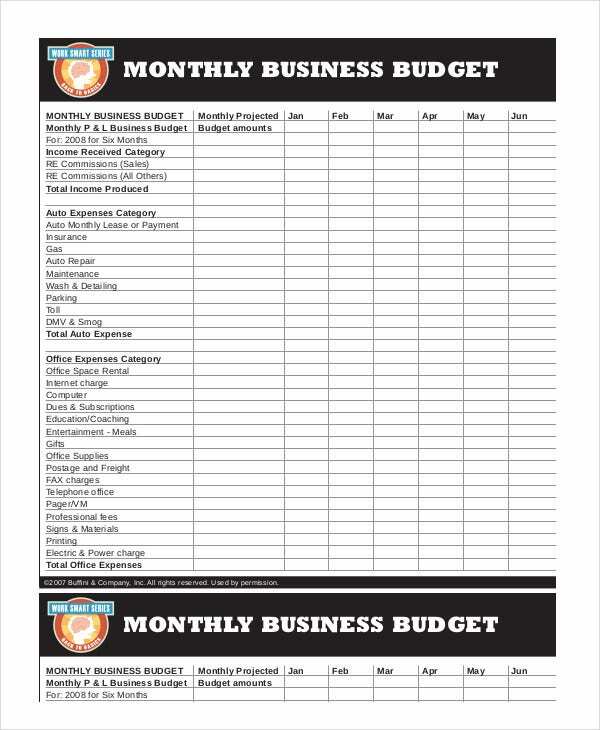 You can use the template here for planning your monthly budget. This beautiful monthly budget planner includes a monthly budget planner, bill pay list, check register, bill calendar, and financial goals. It is available for $10. The files are not editable. > How to structure your Budget? Estimate your income: Determine all your incoming finances, including salary, commissions, bonus, child support, interest, and other sources. Estimate your essential expenses: Every sort of bill including mortgage/rent, groceries, medical, maintenance, gas, gifts etc and your recurring savings deposit should be included in your total expenditure. Stay within your budget: Never go beyond your means by opting to buy something that is not on your planned budget. This will help you to get financially stable. Priced at $30, this comprehensive budget planner set of 80 PDF files includes files like Life planner, My Projects file, My yearly goals, household planner, budget planner, and wheel of balance. These are of 3.7×6.7 inches. 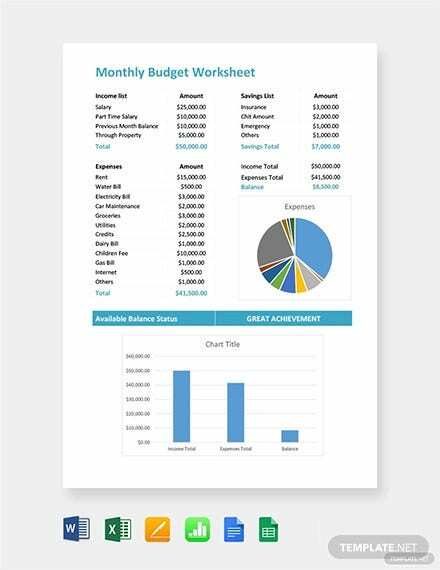 This free personal monthly budget template takes into consideration your income and different expense areas like housing, food, pets, loans, transportation, legal, personal care, insurance, gifts and donation, savings and investments, taxes, and entertainment. 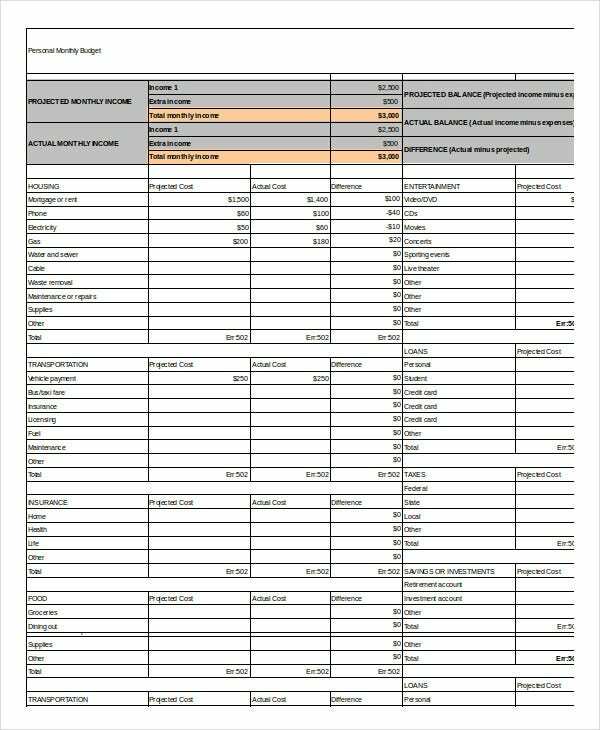 This freely downloadable monthly budget template for adults and families enlists the different areas of your income and expenses. This file comes with a few instructions on how to plan your budget. You can also see School Budget Templates. 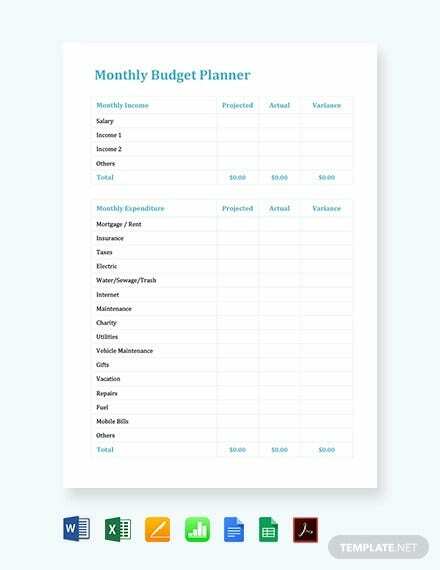 This budget template has been designed for planning your personal budget on a bi-weekly basis. It is available for free downloading. 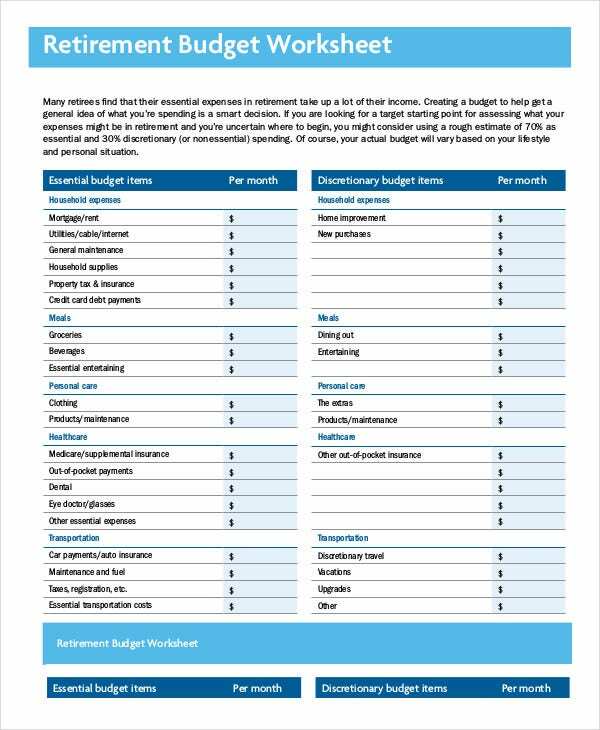 This retirement monthly budget worksheet enlists the essential and the discretionary (non-essential) budget items on a monthly basis. On a rough basis, it is good to keep 70% of your expenses as essential. 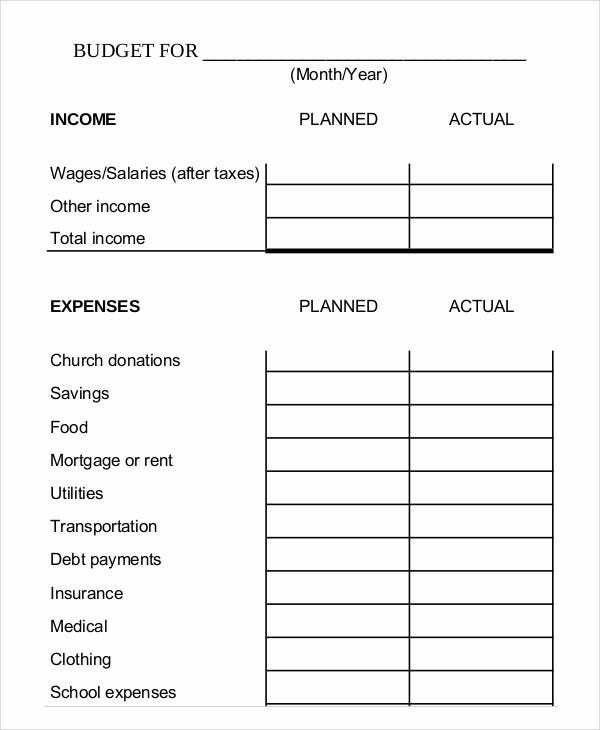 This template helps plan your budget on the basis on your total income and total expenses. 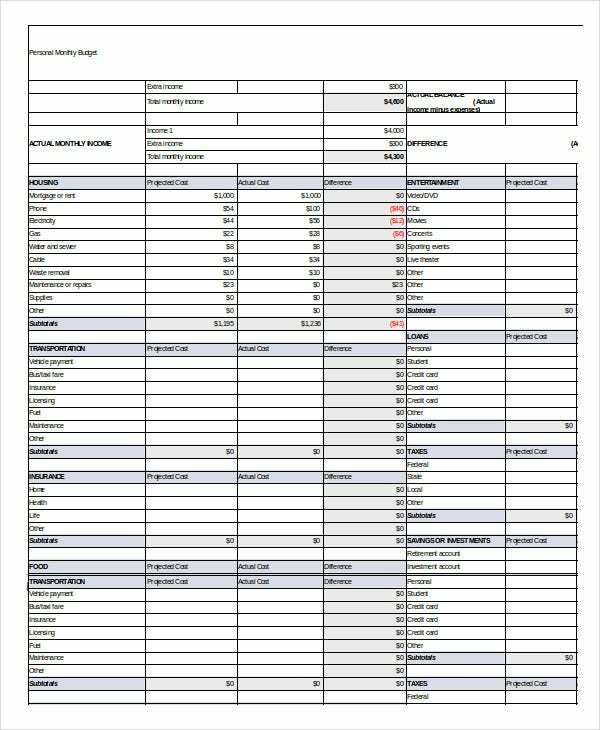 Listings of your income and expense related details and your budget plan estimates are offered in separate sheets. Designed exclusively for students, this template helps students to enlist their resources and calculate their semester financial aid, semester charges, refund bill, monthly income, monthly expenses, and monthly balance/shortfall. 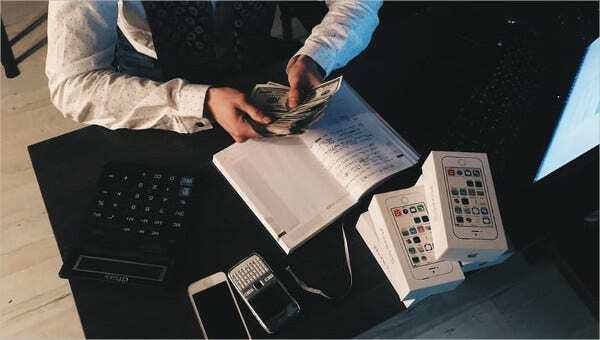 Know your exact income: You need to have a grasp of your actual monthly income. This figure is not your salary. It is your take-home which is bereft of pension plan contributions, income tax, etc. Concentrate on making some savings every month, no matter however little the amount may be. You can also see Free Budget Templates. Keep a track of all your expenditures by retaining the receipts. After adding up these for two or three months, you can get an idea of the average amount spent on each category. This, in turn, will help you understand where you should cut back on spending. Set both long and short-term financial goals. 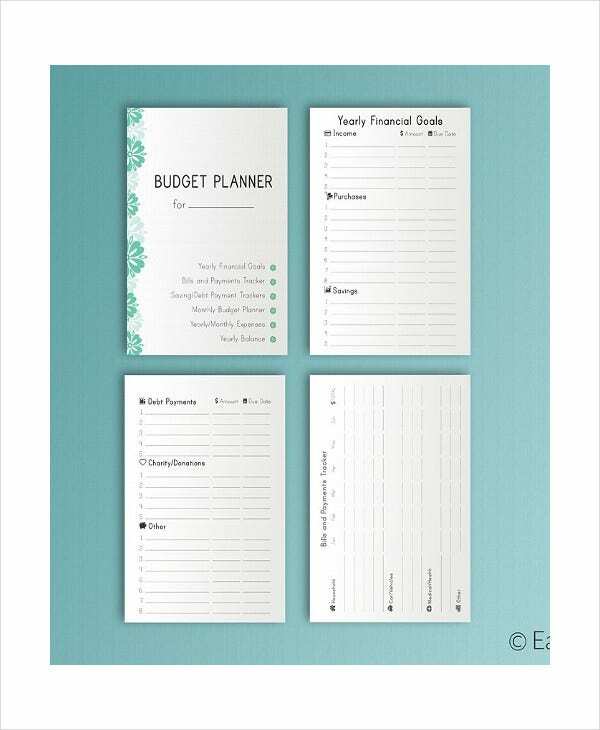 Budget templates are great ways to document and organize your monthly budget plan. Choose an easy to work template like the MS Word template or the Excel Budget template. You can also set yearly financial goals and outline them using a yearly budget template. Whichever budget template you choose, make it a point to use it and stick to it.